Talent Chawapiwa’s agent has revealed why the player did not sign with Kaizer Chiefs or Mamelodi Sundowns after completing a move to AmaZulu during the January transfer window. The Zimbabwean midfielder was signed by AmaZulu from Baroka FC just before the transfer window shut last week. 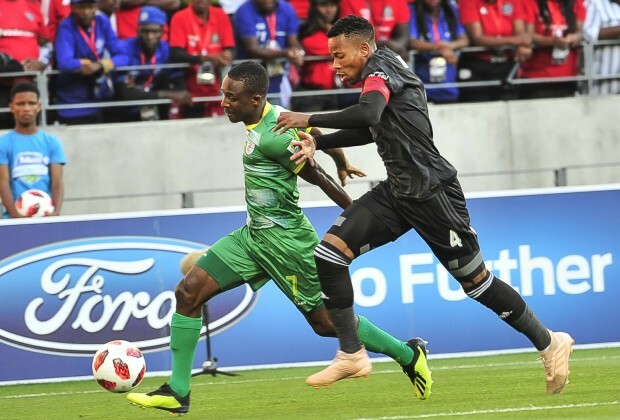 Chiefs and Downs had been linked with the 26-year-old, who helped Baroka win the Telkom Knockout in December with his impressive performances. Speaking to the Siya crew, Chawapiwa’s agent, Michael Ngobeni from M Sport Management, explained the player’s move to Usuthu. “Look, I believe that I owe the fans an explanation on why Talent Chawapiwa signed for AmaZulu (instead of Chiefs or Sundowns). As M Sport Management we work differently compared to other management companies. Talent Chawapiwa’s deal was done a day before the transfer window closed. It had been dragging for some time. We had to find out information about the club he was going to join, the position he plays and who else plays in the same position, does the coach believe in the player, and so on,” said Ngobeni. Chawapiwa joined Baroka in 2017 from Zimbabwe’s FC Platinum. “We also checked who wanted the player. Was it the management or the coach? Zimbabwe fans and Chawapiwa's fans want to see the player play. He is a national team player and the fans want to see him on the field of play. I’m not going to mention other clubs (that had been interested in the player), because that’s water under the bridge now. But we all know the big two that were chasing Talent. One of the two clubs had been chasing Talent from way back last year in June. We delayed that because we wanted assurance that the player was going to play. We couldn’t just be happy for making people happy that he signed for a big club, but we wanted assurance that a Zimbabwean asset was going to play. At the end of the day, AmaZulu showed love. AmaZulu coach (Cavin Johnson) is a big fan of Talent Chawapiwa. As long as he is fit, he’s going to be number one in his position. He is a player who gives his all. We didn’t want to disappoint him by taking him to a club where he was going to sit on the bench and enjoy the jersey and colours of the club,” added Ngobeni. Very good observation Mr Ngobeni, Talent is not fully developed and going to Sundowns would have set him back 4 years. To Chiefs they would have release him again after 6 months. he still need to grow before he can force his way to starting eleven in a big team. to be honest guys Talent is well gifted and left foot educated but for Chiefs and Sundowns he would struggle because he is not yet full developed in terms of crossing the balls, sundowns and chiefs need the player who can hold and cross the ball effectively, look how Simphiwe Shabalala was doing,look how Serino is doing so these 2 teams don't have time for learning curve because they tittle chasers, they don't play to be on top 8 but to win the league but i'm saying Chapiwa is not good he very good but he has to work on finishing, crossing the balls and hold a ball into his feet so that when he final comes to big teams he doesn't benched. remember he is international he has to give more in the field of play. lol so you choose R12K salary with amazulu and play every game over R200K with sundowns and wait for your chance. A Malawian defender is in search of a club in the PSL.